I started writing this shortly after I arrived Ghana. I completed it at the airport on my flight back to Lagos. I’m honoured to be invited to serve on the Grand Jury for the New York Advertising Festival Awards, 2019. The jury parades a stellar list of global creative directors, some of whom have been career inspirations for me. I look forward to a great time. Here’s a link to my jury profile. humanity still flocks into an eastern sprawl, like wildebeest. desert politics romancing global commerce. at once confounding, at once admirable. Arab money responds well to the decibels of luxury. here used to be home. What a year! 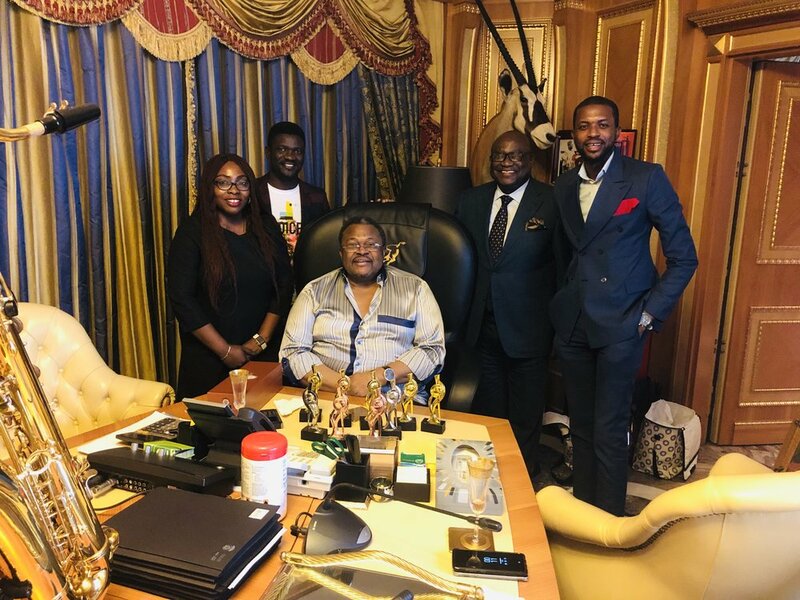 Here, in the photo, my team (and my attention-loving pocket square) present our LAIF award haul to the Chairman of Globacom, Dr. Mike Adenuga Jr, GCON. (Overall, my agency won 23 awards. And the team I directly oversee was involved in 20 out of the total. If for anything, I’m humble like the Jesus guy they named me after). This month makes it exactly a year I joined an agency to lead creative efforts in managing Globacom. I could write a tome about the intrigues and fun in between. Before now, I’d thought running a business was my toughest career challenge yet. But no. I’d thought becoming a creative director in a foreign country where I led a team that looked like a mini United Nations was my toughest career challenge yet. But no. While all the paths I’ve crossed have presented their versions of intrigues, the Glo project puts an icing on everything. (My stupid friends say I’m no longer as creatively feisty as I used to be, that I’ve been humbled. They won’t believe it’s adult life, and not work). But as a certified stubborn creative, the one who puts his head where everyone else fears, I can’t deny that this one has been one heck of a challenge. I could write a tome about my experience, the sheer mental stamina required, the unpredictable motions, the long and endless nights, the crazy commute on Third Mainland Bridge, relationships that suffer, relationships that could have been but never was, personal projects that suffer, the teasing from neighbours that treat me like a visitor than a resident, and working with the coolest team. Today I just want to give a big shout out to my team for creating magic with me during a year. Nothing makes a leader happier than to see your team getting well-deserved accolades. Our works won in some of the coveted categories and I’ve never been prouder of my team. And I’m pretty excited that the commercial I wrote (when I thought I ran out of juice) and that was aired during the World Cup got some of the industry’s nods. On to next year.This month makes it exactly a year I joined an agency to lead creative efforts in managing Globacom. I could write a tome about the intrigues and fun in between. It’s a superbly good film. This is not a review, per se, so I won’t dwell on the plot but will talk about a few things that impressed me — and ones that I find unforgivable. When a film presumably parade “random” stars for the heck it, it usually signals a red flag. I say “random” because when a cast list shows names that aren’t usually associated with film (or theatre), one suspects that a producer is betting on the sensational to pull some numbers, or maybe just using cameos for effect. 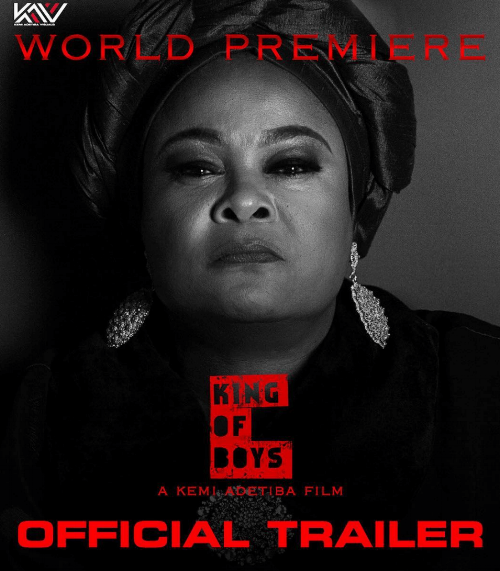 It was my initial feeling when the movie poster for “King of Boys” parades rappers Reminisce and Illbliss — and — after I saw it, fuji legend Kwam 1. I was like, well, it’s fashionably a good marketing idea to use known faces — from culture — to add to a film’s stature. The film follows the blueprint of a gangster story. A lead character is introduced and the audience must decide, based on their moral compass, whether the character is deserving of condemnation or commendation. And being at the mercy of the director, the audience would struggle to reconcile empathy with indignation. Spoiler: The ending feels like a prank on an overly critical, overly cynical, moralist. (At one point, the film reminded me of “Third Word Cop,” except that the grunge and grime of that Jamaican story are replaced with some gloss and a nice colour-coding from an editor that probably knows how to use filter to enhance “dark” story). But Eniola (Sola Sobowale) isn’t Ratty. She’s a ruthless politician and kingpin of a clever network of gangsters who run things at the highest level of Naija organized crime. And since we’re talking Nigerian crime, all the components are here — politics, dollars, the diabolical, sleaze, family business, and NCCC (Of course, you know where that came from). The main lure of the movie is its authentic handling of its twists and turns. (But I promise not to dwell on the plot). That guy, Reminisce. The guy is ipata-raised-to-power-100. Excellent Mafioso actor. But, people of Gosh, I cannot forgive or forget the scenes where a ram is killed and a chicken is dismembered!!!! I can’t unsee those scenes!!! Just when I was already rooting for some foreign nods, then I saw those. Where’s PETA? And then, the representations of white garment church by the seaside, alongside traditionalist are uncharitable. Aren’t we tired of mocking these people’s ritual forms? May Gosh forgive all of you storytellers — including Wole Soyinka and his famous prophet character and the silly memes. (That’s a lovely trailer poster destined to be iconic. If the bloody red and arrogant fonts don’t register on memory, Sola Sobowale’s mean mugging against a noir will do the trick). This is such a good (and almost-balanced) appraisal of the Nigerian creative scene. I say almost-balanced because, while extolling the elements that a foreign and high-culture audience can relate with, it ignores two critical components of the Nigerian creative space - the unbridled creativity stemming from the “streets” and the dynamics of business. So far, the street culture - with the exception of traditionally upper-class-upper-upper-middle-class creative domains (Galleries/exhibitions, high-class fashion etc.,) feeds the high culture. It makes for a beautiful Nigerian phenomenon. The high culture, only with capital, network and distribution resources, have always “win” in controlling the overall narrative, to the foreign audience especially. Beautiful article that didn’t do much to explore how the business value-chain is being managed and sustained, and who enjoys the returns the most. We set to create a Mother’s Day campaign that celebrates mothers and motherhood in a way that resonates with our African audience. Traditionally, African mothers play a key disciplinarian role in the family. It’s a role that they sometimes played with firm hands and, where stern looks and raised voices didn’t deliver results, it wasn’t uncommon for harder measures to be employed. We decided to whip up nostalgic emotions and trigger conversations around this role – especially as many grownups in African communities look back fondly on these corrective episodes with loving mothers. Each ad humorously profiles the common tools used during a mother and child squabble, and use them to remind ourselves about the love that came in form of discipline. In essence, here’s to the mothers who made us – and the tough love that forged us. The Campaign has since gone viral especially in some African countries and I'd like to thank my team members - Abraham Cole (Art Director), and Adebayo Arisilejoye (Copywriter) for coming through on this. Thanks for creating beauty. Thanks for your works that fed my soul - "Love in the Time of Cholera," "The General in His Labyrinth," "One Hundred Years of Solitude". Thanks for the quotes I return to when I need to be reminded about the futility and illusions of life, and the silliness of the human condition. I didn't like magical realism until I read your works. Continue to rest in peace as the world celebrates your birthday, today! The Rumours are True. Creative Director, Glo. Agency, SO&U.